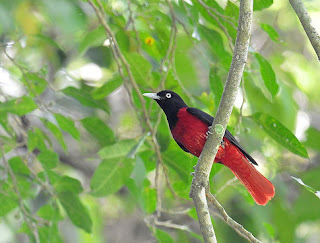 Wednesday and Thursday found me in the greater Maolin area with a client in search of culture, butterflies, plants - and birds. Not the best of weather - cool and a bit damp at times, a pity it is usually lovely down there at this time of year. Nevertheless a few good birds were added to the list. 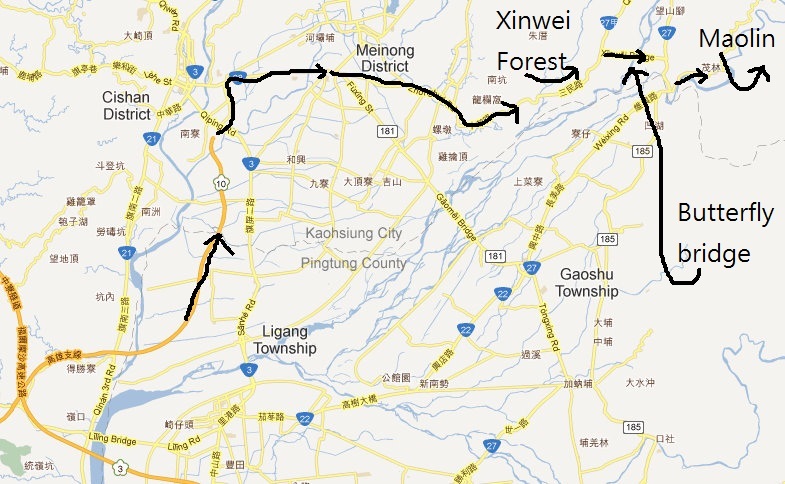 Maolin is a valley in southern Kaohsiung County (close to Pingdong County) most famous for it’s wintering Purple Crow Butterflies (Euploea). It is also a good destination for low-elevation bird hunting and as a base for trips to Tengjhih for mid to high elevation species. Note, Tengjhih FRA is not yet open to the public but the road (through various good habitat) up there is passable. This part of Taiwan was hit hard in 2009 by Typhoon Morakot , many visible scars and reconstruction work. On the way to Maolin we visited Meinung - the southern center for the Hakka people. The farm fields between Meinung Town and the Yellow Butterfly Valley turned up Little Ringed Plovers and a thrush I think (not listed below) was a Grey-backed Thrush. 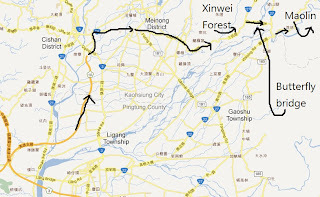 The best way by car to Maolin is to take Freeway #10 to the end at Qishan (Cishan), follow #28 through Meinung, to the big purple bridge that takes you across to the edge of the mountains and a short section of #27 before Maolin Valley proper. Just before the intersection for this bridge (shaped like a butterfly) is the small Xinwei Forest Park, good for birds including sometimes the Black-naped Oriole (not seen this time unfortunately) and raptors. An excellent place to stay in Maolin is De-en Valley Guesthouse, run by a friendly aboriginal family known for their enthusiasm for protecting environment. Their son, ‘Big Head’ 0989579751, speaks English and guides guests around the area. The road approaching their homestay, on the south side of the main valley, is the best I know for viewing nightjars. Be sure to walk the, bird-rich, 4km-long farm road that starts just behind their house. On the hillside behind Maolin Village there is a good loop path for viewing butterflies - and if lucky Blue Magpies. In the light rain we visited the ever-attractive Wutai admiring slate carvings and looking for Russet Sparrows. No sparrows seen, but Olive-backed Pipit and Oriental Turtle Dove ticked off. Note the road to Wutai is passable but vulnerable to landslides. Birds of the trip would have to be the Nightjars and Black Eagle for their fantastic close proximity. Savanna Nightjar Caprimulgus affinis "Taiwan Endemic Subspecies (C. a. stictomus)"
Maroon Oriole Oriolus traillii "Endemic subspecies (O. t. ardens)"
Bronzed Drongo Dicrurus aeneus "Endemic subspecies (D. a. braunianus)"
Black-naped Monarch Hypothymis azurea "Taiwan Endemic Subspecies (H. a. oberholseri)"
Gray Treepie Dendrocitta formosae "Taiwan Endemic Subspecies (D. f. formosae)"
Collared Finchbill Spizixos semitorques "Endemic subspecies (S. s. cinereicapillus)"
Plumbeous Redstart Rhyacornis fuliginosa "Taiwan Endemic Subspecies (R. f. affinis)"
Gray-cheeked Fulvetta Alcippe morrisonia "Endemic subspecies (A. m. morrisonia)"
Oriental Turtle-Dove Streptopelia orientalis "Taiwan Endemic Subspecies (S. o. orii)"